Lake Ranau is the second largest lake on Sumatra. It was formed by a major earthquake and vulcanic eruption. A big river which previously flowed at the foot of the vulcanic mountain then filled the ravine. Various types of plants incuding bushes locally known as ranau, then grew by the lake and while the remains of the mountain became Mount Seminung, which currently stands tall beside the clean lake water. This lake is located by the border of Lampung Barat district in Lampung province and Ogan Komering Ulu (OKU) Selatan district in South Sumatra and has cool weather. 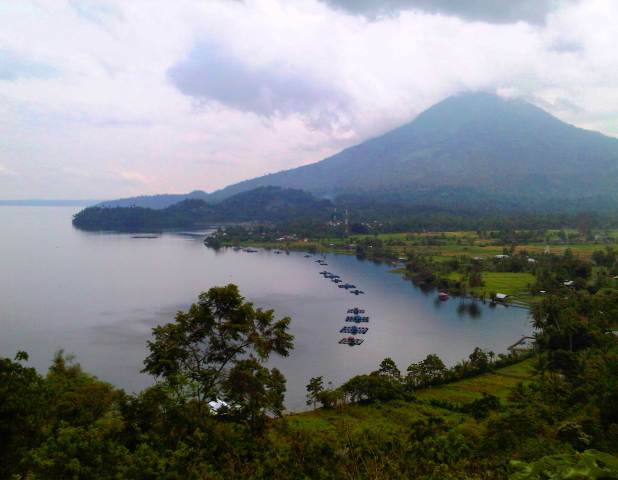 To enter this lake, visitors need to pay Rp 1.000 (about 10 cents US) per person plus Rp 4.000 (40 cents US) for parking. Marisa Island is located in the middle of the lake. It has a natural hot water spring. Visitors are charged Rp 1,500 per person. The island also has a waterfall and extensive rice paddy fields, and most of its land is covered by forests with primates. To travel around this 44 square kilometer lake (about 10872 acres), visitors can take a motor boat, locally known as a ketek. The rates vary from Rp 100.000 to Rp 250.000 (about 9-23 US Dollars), depending on whether or not you want to travel around the lake. To see the waterfall, you should take land transportation. Lake Ranau is famous for its abandunt giant fish. You could also buy fish from fishermen. You could enjoy the beauty of Lake Ranau while eating grilled fish and drinkig a cup of hot tea. Don’t forget to drop by the hot water spring on Marisa Island.